Pápai Páriz Ferenc, Album amicorum p. 215. Nobilissimo & Liberalissimo D. Possessori Magni Parentis sibi ante hos 46. annos coniunctissimi haud minori Filio felicissimo, sui memoriam commendat, optimi quaeque apprecatus. Tig[urini] Helv[etiae] Metrop[oli] d. 11. Jul. 1719. * 1Jn 4:4: Vulgate: „quoniam maior est qui in vobis est quam qui in mundo”. I recommend myself into the memory of the noble and eminent owner [of this book], God-blessed and worthy son of his great father – with whom I had been on close friendly terms 46 years ago –, and I wish him all the best. Johann Jakob Hottinger was born on December 1, 1652 in an ancient civic family of Zürich, a son of the orientalist ant theologian Johann Heinrich H. (1620-1667). His brothers were the orientalist Johann Heinrich H. (1647-1692) and the physician Salomon H. (1649-1713). He finished his theological studies in the Carolinum of Zürich, then in 1672-74 in Basel. After this he wanted to go to Marburg, but prevented from this by the French-German wars, he went to Geneva. In 1676 he returned home, and was appointed a pastor in Zürich. In 1680 he became a pastor in the nearby Stallikon, and in 1686 diacon in the Grossmünster of Zürich. In 1698 he became a deacon, and was appointed professor of theology at the university of Zürich, on the place of the late Johann Heinrich Heidegger (1633-1698). He provided with great zeal for all his offices. He wanted to continue the church history of his tragically deceased father – who was drowned in the river Limmat with his three children and his friend during a boat trip – and to defend his father's honour and his catechism against the attacks. For a while he continued the volumes of the Historia ecclesiastica from the Tridentinum (1545-63), and then he wrote his chef-d'oeuvre, the church history of Switzerland, in a controversial and rough style, but with an admirable historical knowledge. In 1719 Switzerland celebrated the bicentenary of the Swiss reformation and the centenary of the Synod of Dordrecht, and this gave a new impetus to the efforts at the unification of Protestant confessions. Hottinger himself wrote a number of such eirenic works, thus continuing the oeuvre of his professors, Heidegger, Lucas Gernler (1625-1675) and François Turrettini (1623-1687), the founders of the Consensus helveticus of 1675. He believed that only the Bible could be the foundation of teaching, and the differences of opinions have to be accepted in all the other questions. He affronted the rising pietism. He was a cheerful personality and a clear lecturer. In 1729 he had a stroke, but slowly he recovered and returned to his office. He died on December 18, 1735. Some of his works: Biblische Prob des zürcherischen Catechismi, Zürich, 1685. 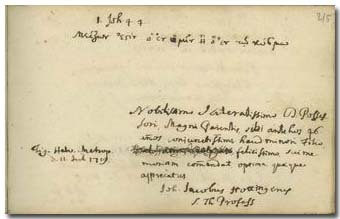 – Helvetische Kirchen-Geschichten … Zürich, 1698, 1707, 1729. 4 Thle. – Dissertatio irenica de veritatis et charitatis amicissimo in Ecclesia Protestantium connubio, quam praeside Joh. Jacobo Hottingero … sustinebunt … Juxta exemplar Tigurinum. Tübingen, 1721. – Pentas Dissertationum Biblico-Chronologicarum, Utrecht, 1723. After a reassuring Biblical quotation, Johann Jakob Hottinger refers to his friendship made forty-six years ago with the father of the owner of the album. Around 1673 Ferenc Pápai Páriz, Sen. (p. 447) had really been in Switzerland, where he made friendship with a number of persons, among others with the Hottinger brothers who were about the same age of him.